We are super excited about this most recent bit of news! Why did we test so well? We have always followed the procedures of the Paris study to a T. The key factors in achieving the fully saturated state are to use 5 whole grams of C60 per liter olive oil, as outlined in the study, even though only 0.8 grams will dissolve into solution, and to mix mechanically for two whole weeks. These are the things, along with centrifugation and sterile filtering as detailed in the original process, that we have always done and will continue to do. 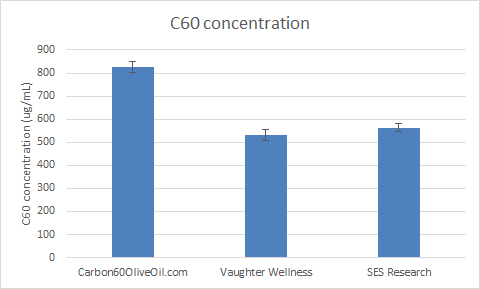 A big Thank You from all of us at carbon60oliveoil.com to everyone at Longecity for taking the time to test the various C60 products! We are so pleased that our honest, hard work is being recognized. We take pride that you can buy our C60 Olive Oil with confidence that it delivers exactly what is stated on the bottle!